Brother Tom Fitzgerald SMA celebrated the 70th Anniversary of his membership of the Society of African Missions with a Jubilee Mass led by Fr Fachtna O’Driscoll SMA, Provincial Leader. The Mass was celebrated in the SMA House at Blackrock Road where Brother Tom has lived since his return from Africa in 2001, after fifty years unbroken mission service. His first eleven years as an SMA were spent in the SMA Houses in Blackrock Road and Wilton. From 1951 until 2001 he used his many talents to build up the Church in western Nigeria, particularly in what are now the dioceses of Ekiti and Ondo. Tom Fitzgerald was born in Cahirsculliveen, Ballydavid, Dingle on 25 January 1919. From his earliest years he was seen to have a ‘gift with his hands’, showing great interest in carpentry, plumbing and brick-laying. After joining the SMA these skills led to him getting involved personally in the hard gruelling physical labour of building. During those 50 years Tom, with his team of labourers, built Primary and Secondary schools, Clinic and hospitals, Churches and Mission Houses. Among them are Aquinas College (in Akure), St Joseph’s College (Ondo) and Stella Maris College (Okitipupa). The Medical Missionary Sisters (MMM) Hospital in Ondo was built with Tom’s attention to detail. The Sisters of St Louis asked him to build their Colleges in Akure and Ondo as well as the Maria Assumpta Hospital in Ado Ekiti. The impressive Sacred Heart Cathedral in Akure was one of the many churches built by Br Tom. In the early 1960’s Brother Tom responded to a request from Monsignor William Mahony SMA, Prefect Apostolic of Ilorin, to supervise the building of the Notre Dame Girls’ Secondary School in Oro, Kwara State. Before returning to Ireland in 2001, he moved to the SMA Regional House in Ibadan to supervise the construction of the house from which Fr Ali Kelly SMA runs his Youth Ministry programme which continues to this day. Each and every building project he undertook bears the stamp of his undoubted skills. But, as Fr O’Driscoll reminded us, to think only of Br Tom as a builder would be to miss the deep compassion he has for those in need. Leprosy is a reality for some people in Ondo State. Tom noted that the local Leprosy settlement was in a very poor state and, with Sister Philomena McGuinness SSL, he rebuilt the complex for its residents. Quoting a fellow missionary, Fr O’Driscoll described Tom’s style as “more of a gentle breeze than a raging wind”. Though Tom is a man of action, all his work is based on a deep quiet spiritual life, not trumpeting his achievements but doing all for the glory of God and the growth of the Church in Nigeria. Truly it can be said that for Br Tom his entire missionary life has been Ad Majorem Dei Gloriam (For the greater glory of God). Those who lived with him can attest to his sense of humour, his love of the Irish language and a huge interest in all kinds of sport, most particularly the achievements of the Kerry Senior Football team. In his own remarks during the celebration, Br Tom paid tribute to his fellow missionaries who went out each week to visit the Outstations with their Mass Box, camp bed and provisions, spending several days in each place before returning to the central Mission. 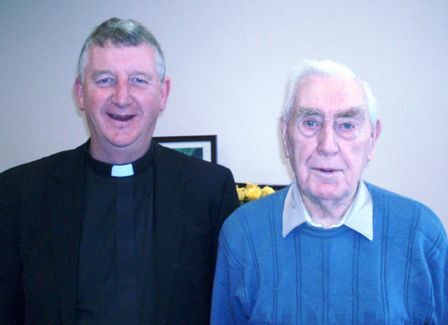 Tom remembered them as “great men” – much in the same way as we see Brother Tom Fitzgerald SMA. Long may we continue to benefit from his prayers, his friendship and example.